From snarky exchanges between official Canadian and Russian Twitter accounts, conflicting representations of Crimea in Google Maps and OpenStreetMap, and a recent piece by Peter Pomerantsev in The Atlantic on how Vladimir Putin is revolutionizing information warfare, the ongoing conflict in the Ukraine has been widely reflected online. One particular manifestation of this conflict on social media was the #RussiaInvadedUkraine hashtag, which emerged at the end of August as Russian troops appeared in Eastern Ukraine. The hashtag has served as a social media rallying point for supporters of Ukraine, with the New York Times reporting that in the first day of its existence, over 500,000 tweets using the hashtag were sent. Wondering what the spatial distribution of this hashtag looked like across Europe, we fired up DOLLY and collected all geotagged tweets containing the hashtag sent from European countries between August 27th and September 7th, 2014, resulting in approximately 4,500 tweets. To control the effect of single, very active, individuals sending many tweets -- and to better represent aggregate rather than individual actions -- we only included the first five tweets from any single user, resulting in a total of about 2,100 geotagged tweets. These tweets were aggregated to the country level and then normalized by the total number of tweets sent during this same time period, resulting in a location quotient for each country. The location quotient indicates the relative prevalence of tweets containing the #RussiaInvadedUkraine hashtag compared to the overall level of Twitter activity during this same time. Values greater than one indicate that people in a given country contributed a greater number of tweets about this topic than would be expected based on usual tweeting levels, with values less than one meaning that they were underrepresented in tweets using this hashtag than one might usually expect. 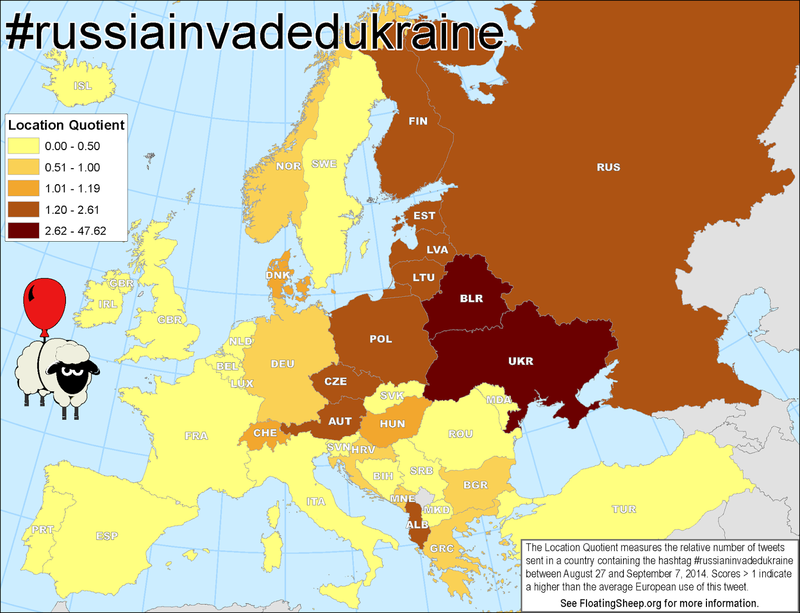 The map above illustrates a strong concentration of the #RussiaInvadedUkraine hashtag in countries that are nearer to the Russian border. In short, a classic example of a distance decay function, in which distance from a phenomenon is inversely related to attention or presence of a given phenomenon. In general, most countries within Eastern Europe -- including Russia itself -- show a higher level of Twitter activity around this hashtag, with some exceptions such as Moldova, Slovakia and Romania. In particular, however, the Ukraine and its neighbor Belarus show an extremely high level of activity around this issue, with the Ukraine alone contributing roughly 48x more of the tweets using this hashtag than it did to the baseline sample used for normalization. Conversely, as one moves westward, the level of participation in this social media meme drops considerably. 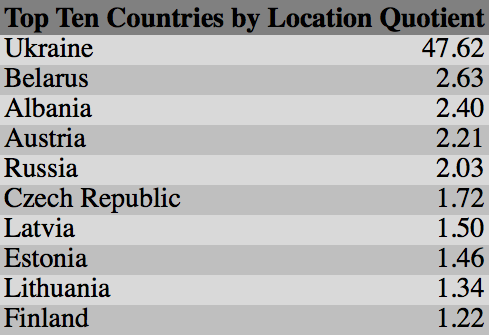 While Germany, which is both geographically and relationally more proximate to Eastern Europe has a location quotient of just 0.81, the Netherlands and Italy have scores of 0.25 and 0.22, with the UK and France having extremely low location quotient values of just 0.05. Of course, Twitter is not an unproblematic representation of the population, and tweets containing this hashtag can express a range of sentiments from both sides of the conflict . Quite clearly, the interest and official response from western states (and their militaries) is not tied to the level of popular participation in social media activism. Instead, as we showed in the case of tweeting related to Ferguson, Missouri and the protests around the shooting death of an unarmed black teenager at the hands of a police officer, geography matters when it comes to directing our attention to news and current events, with people more directly connected to these issues having a much greater level of interest and concern ... even when it involves the invasion of military forces from one country into their neighbor. Although a quick review of the text reveals that these tweets are primarily critical of Russia's actions. Of course, this shouldn't be particularly surprising. But for some people, it is.